Interviews are all about making a great first impression. And granted, there are a lot of articles you can find on the internet which’ll tell you how to do exactly that. However, something not so commonly found on the web is what NOT to do in your first meeting with a potential employer. The things that really grind their gears and that you should definitely avoid. 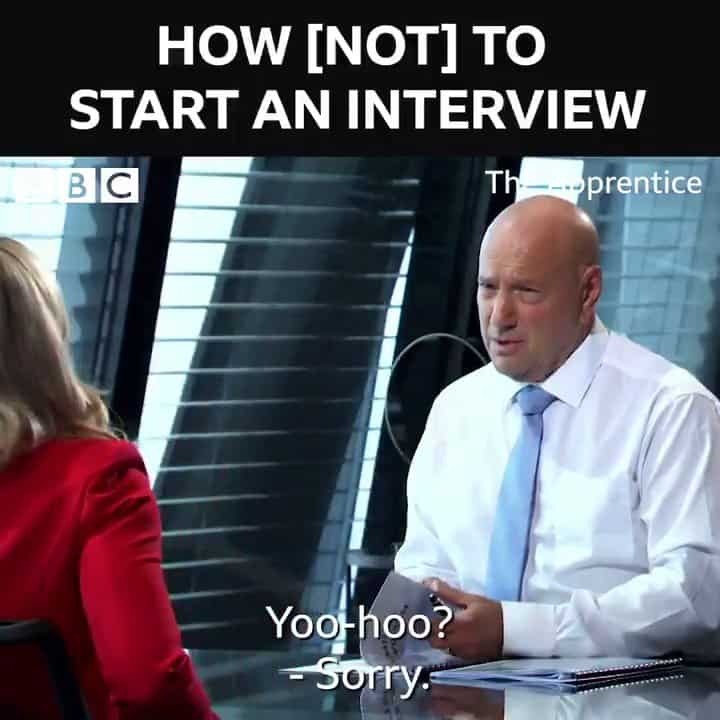 Luckily, if you have an interview pending and are worried about slipping up and making mistakes, we’ve got you covered. Read on for a glimpse into what annoys an interviewer, and what therefore demonstrates what you clearly shouldn’t be doing. You may know an interviewer, you might even be friends. However, in an interview environment – a certain level of professionalism is expected to be upheld. A big slip-up that potential employees make is being too laid-back. Nobody wants a robot as a candidate, but at the same time – jokes and colloquialisms in every sentence can show your interviewer that you’re sloppy, cannot maintain a professional manner and can also indicate that you’re ‘not too fussed’ about the job on offer either. TMI Top Tip: Always meet your interviewer with a professional yet friendly greeting. If, as the meeting goes on, you notice they start to speak to you in more of a nonchalant manner, then it’s okay to ease up slightly, but you should never drop your level of professionalism entirely as being unseemly is a sure-fire way to taint your first impression. Perhaps one of the top vexations of the modern day interviewer is when a candidate has evidently lied on their CV, or even worse – when they sit in the interview on the day and stretch the truth. Interviewers can, and do check as to whether there’s validation to what you’re saying and if they find any anomalies you can certainly expect this to be flagged in a meeting. Or, it’s even likely that a red cross will be drawn through your name before you’ve even had time to explain. So in short, don’t do it. If you have a gap on your CV that you’re contemplating a porkie to explain, then stop right in your tracks. Perhaps this article will help you explain it without having to lie to your potential employer. Or, if for any other reason you’re contemplating including something on your CV that isn’t necessarily correct, hold up a second and think about the implications when you’re inevitably found out. TMI Top Tip: Telling lies never did anybody ever good, and it won’t for you either. Be honest and transparent with your interviewer. They’ll appreciate your honesty a lot more. Tardiness is a mistake that is often not overlooked. If you’re late to your interview, it tells an employer a lot about you if you cannot present a just reason. And even then, it still demonstrates a lack of forward planning. Basically – just don’t do it. Lateness, even if it’s just a few minutes, foreshadows the future of you as an employee. Plus, it leaves a potential employer to question how passionate you are about the role for which you’re interviewing if you cannot make the effort to arrive on time. TMI Top Tip: We’d recommend jumping on that early train, or leaving half an hour early to accommodate for traffic. If you arrive at your interview location far ahead of your meeting time, then why not grab a coffee to calm your nerves before heading in? Arriving just slightly early (say, 5 minutes) shows you’re keen while not inconveniencing the company either. If there is a genuine reason for your lateness, call or email the person you arranged the interview with asap to apologise ahead of time. Though always an awkward conversation to arise, when asked why you left your previous establishment, slating the boss or the business is never a good answer. This is sure to annoy an interviewer because firstly, it’s the epitome of unprofessionalism. And secondly, it shows an interviewer that if you’re open to slating previous places of employment, you’re just as prone to defame their company too. This includes being positive about your past experiences. Even if you’re getting the most encouraging vibes from your interviewer, be under no illusion that slating your past employer is ever okay. It holds the capacity to quickly turn a conversation sour and can blacklist your name. TMI Top Tip: If you genuinely did leave your past employment due to disagreements, and don’t want to lie to your interviewer – then rather than slate your ex-boss, tell them that amid other reasons it was a conflict of interest. Better yet, expand on this to draw out the positives. E.g. you wanted to continue to grow in the company and do more within your role, but you felt restricted and unable to do so – so you sought a new venture with a more varied role, like the one you’re interviewing for. For more recruitment advice and tips, take a read through our other articles. Or, to kick start your digital career – get in touch with TMI Resourcing today and find out how we can help you to land the job of your dreams.